MANILA - The National Police Commission (NAPOLCOM) announced today the schedule of PNP entrance and promotional examination this 2015. The bulletin also include details for Online Application Examination Application Scheduling System (OLEASS) and period of filing. 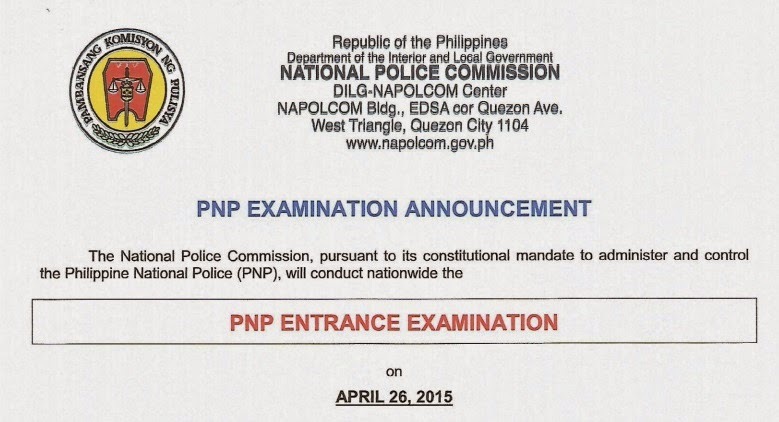 The first NAPOLCOM exam this year is set on Sunday, April 26. The online application scheduling (OLEASS) for entrance exam will open on February 16 to 20, 2015 while OLEASS for promotional exam will be activated on February 23-27, 2015. The period of filing is set on March 2-27, 2015. To learn more about PNP recruitment, visit here. Scheduling system for PNP Entrance and Promotional Examination is open up to the specified date. However, NAPOLCOM limits the number of applicants on quota-basis. Acceptance of application shall be on a first come, first serve basis. Applicants shall utilize the on-line system to request the Regional Office for their schedule on the filing of examination application. Applicants will personally appear at the NAPOLCOM Regional Office on the date assigned to them, with their printed on-line confirmation letter and other required documents, for further evaluation. "Only applicants with a confirmed schedule of appointment with reference number shall be entertained". The On-Line Examination Application Scheduling System (OLEASS) was opened to systematize scheduling of processing of exam applications at the NAPOLCOM NCR office and 15 regional offices nationwide. On the other hand, promotional exam is open exclusively to all qualified uniformed members of PNP who meet the minimum qualifications standards for examination in terms of rank and eligibility. PNP Promotional examination covers the following categories: Police Officer, Senior Police Officer, Police Inspector and Superintendent.